Alright folks, so you don&#39;t feel left out all the other army boards are getting quizzes I&#39;ve made one for the followers of the Dark Gods. PM me(or any other Chaos Mod) your answers and if you answer 8/10 questions correctly you get +1 karma. Do not post answers in the thread! However, to get karma you will need to reply to the thread, so just post "PM sent" or something similar so I can hand out karma to those whose answer enough questions correctly. 1. Q: The Luna Wolves/Sons of Horus Terminators were known as what before the Heresy? 2. Q: Zso Sahaal was the Captain of the Raptors of which Traitor Legion? 3. Q: Which Chaos Legion still maintains a form of Chaplain? 4. Q: On what planet did Kharn earn the name "The Betrayer?" 5. Q: After what Crusade were the Luna Wolves renamed Sons of Horus? 6. Q: What was the original Chapter name of The Company of the Shadow? 7. Q: During the Horus Heresy the Thousand Sons homeworld of Prospero was attacked by what Chapter? 8. 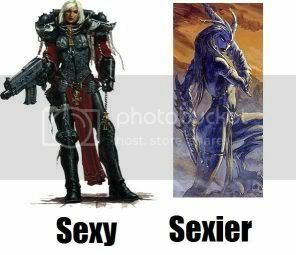 Q: Fabius Bile is known by several different names. Name three of them. 9. Q:What is the name of the disease Typhus spread among the World of Florins? 10. Q: What is the name of the fifth Chaos God that has been removed from the fluff? I am still writing my answers, but I think you may have misspelt the name of the guy in Q.2. PM Sent. Nice quiz, I had to break out my books! My answers are en route! Answers are in. For the Emperor!